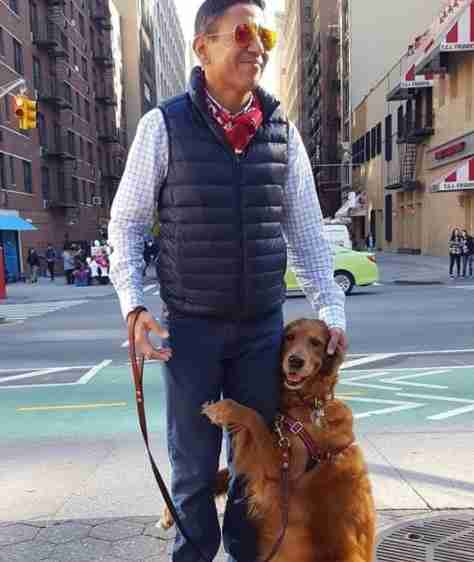 Whenever Cesar Fernandez-Chavez walks his dog Louboutina in Manhattan, it's never an ordinary walk. 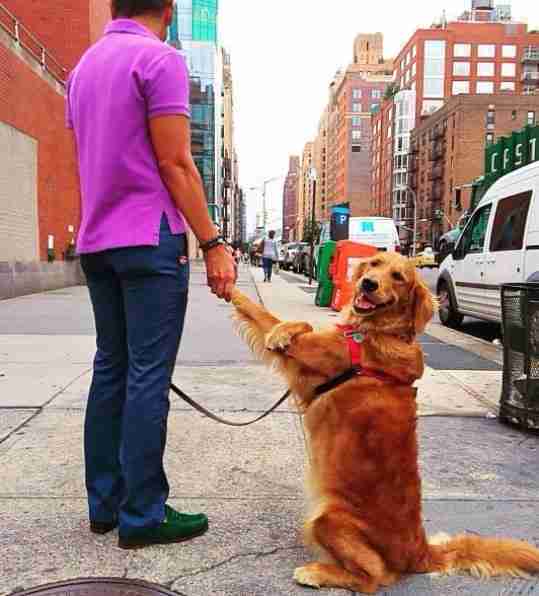 Within minutes of hitting the sidewalks, Louboutina (or Loubie for short) wants to stop, greet people and then hug them, wrapping her forelegs around their knees. 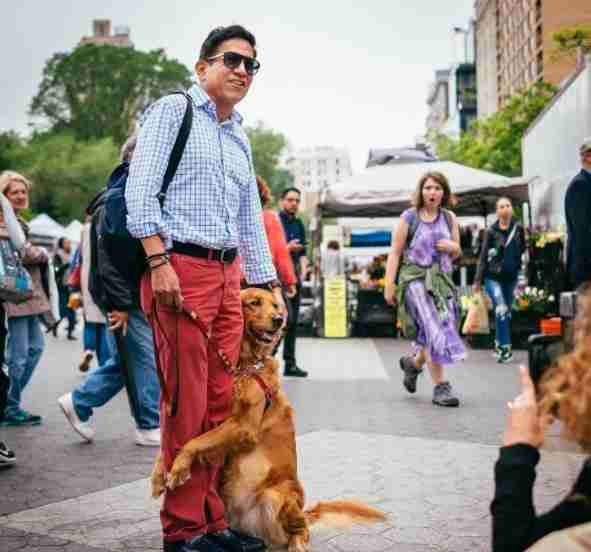 "It's just not a regular walk," Fernandez-Chavez tells The Dodo. 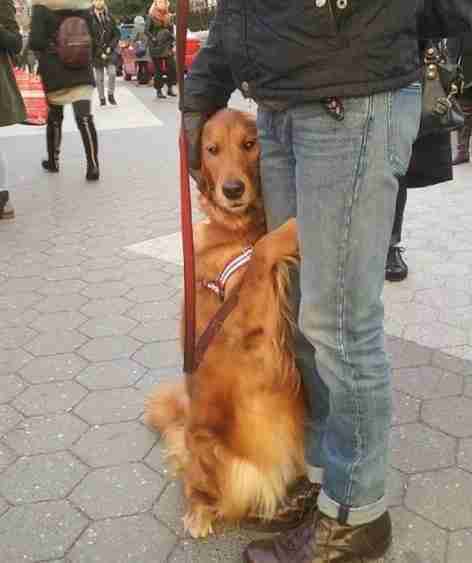 "It's a walk with hugging. So we don't get to go too far." Fernandez-Chavez never taught Loubie to do this - he says she does it all on her own. Before Loubie started giving hugs, she wanted to hold hands. That tradition started around Valentine's Day in 2014, shortly after Fernandez-Chavez had ended a long-term relationship. "She started sitting up and grabbing my hands with both of her paws, and then crossing the other paw over her paw," Fernandez-Chavez said. "I remember joking with my friends, 'At least I have someone to hold hands with during Valentine's.'" 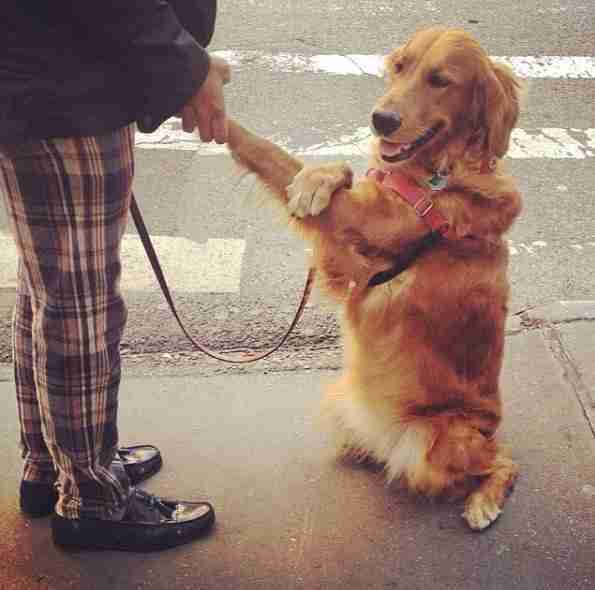 Holding hands quickly became Loubie's favorite thing to do, and she usually did this during walks out in New York. "From then on, every walk, she wanted to hold hands," Fernandez-Chavez says. 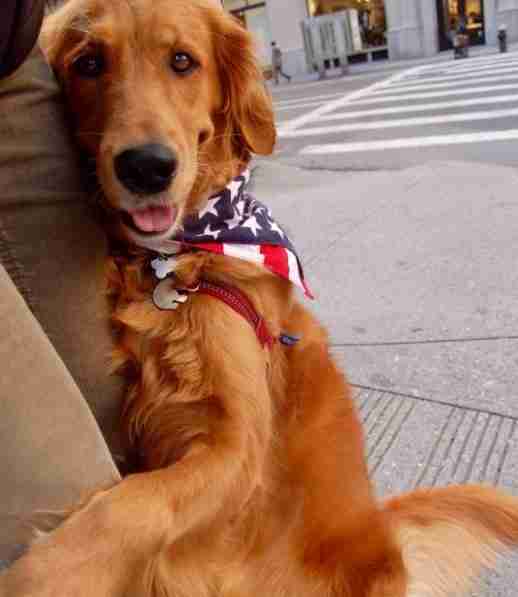 "She would just sit up and cross her paw over the other, and look around like a lady. 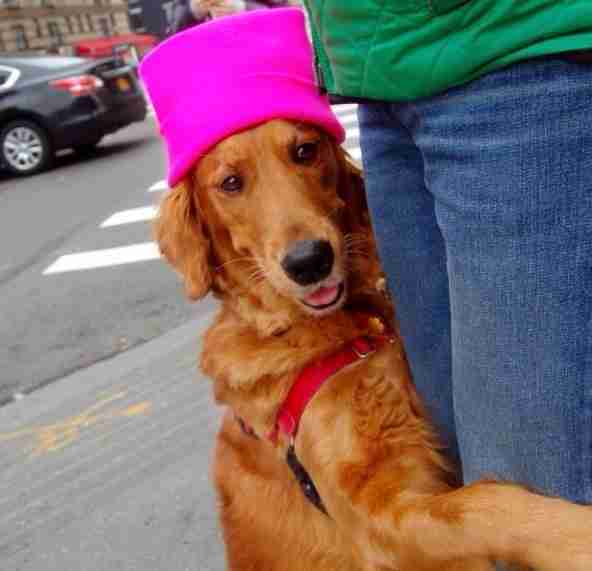 People passing by were like, 'Oh my god, she's so cute.'" 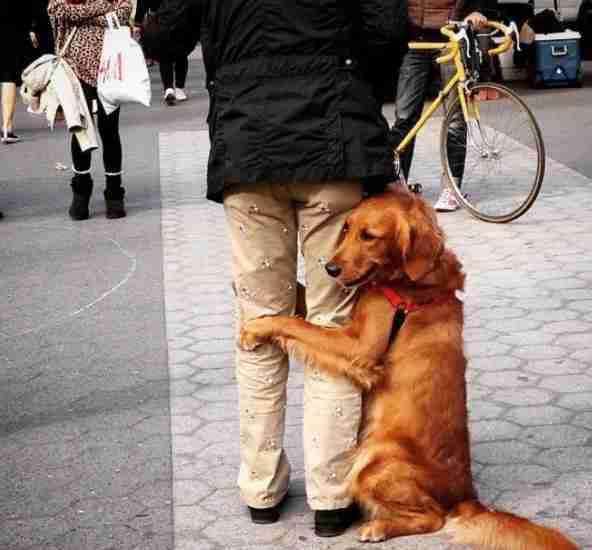 Then, a couple years later, Loubie started showing her affection a different way - with hugs. "Instead of asking me to do the holding hands thing, she just sat up, very close to my legs, and she'd wrap her legs around my knees," Fernandez-Chavez says. "I thought, 'This is weird. What's going on?' But I let her do it." Loubie kept hugging. 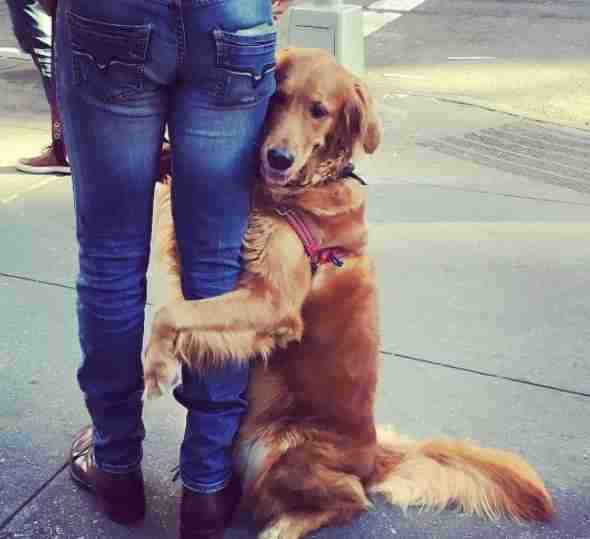 And hugging. And hugging. Sometimes she didn't want to get go. "She gets a very good grip, depending on where I'm standing," Fernandez-Chavez says. "I have to make sure that I'm keeping well-balanced." It's a good thing Fernandez-Chavez isn't the jealous type, because it didn't take long for Loubie to start hugging other people, too. "We'd run into neighbors that she knew," Fernandez-Chavez said, "and instead of just leaning on them, she started hugging them, and then random people who would come to us." 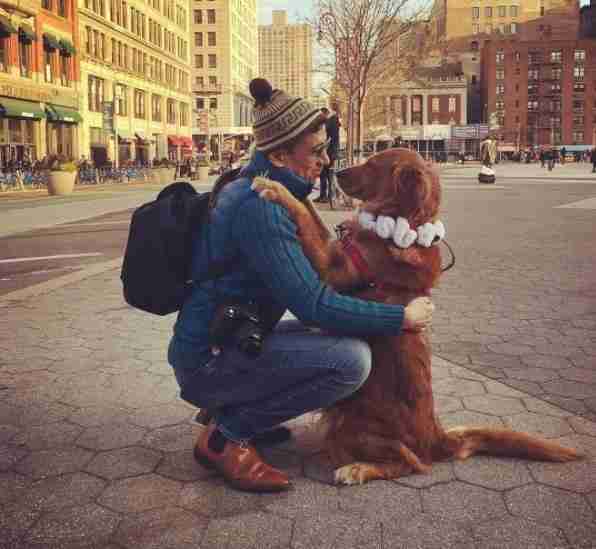 Loubie quickly became a social media star - people couldn't get enough of Loubie and her hugs. "Pictures started coming up on the internet," Fernandez-Chavez said. While Loubie is quite generous with her hugs, she doesn't just hug anyone - she only hugs people she makes a connection with, according to Fernandez-Chavez. "Sometimes people run up and ask for a hug, but I tell them, 'I don't think it's going to happen,' because she has to bond with that person first," he said. "But when she sits next to someone, then I say, 'You're probably going to get a hug.'" Loubie seems to love hugging people - she wouldn't do it if she didn't. And the people she embraces clearly love it, too. "It's nice to see people walk away with a smile," Fernandez-Chavez says. "Especially with everything that is happening now, people say it's so good to see this on the street. She's bringing them joy. It's very rewarding." 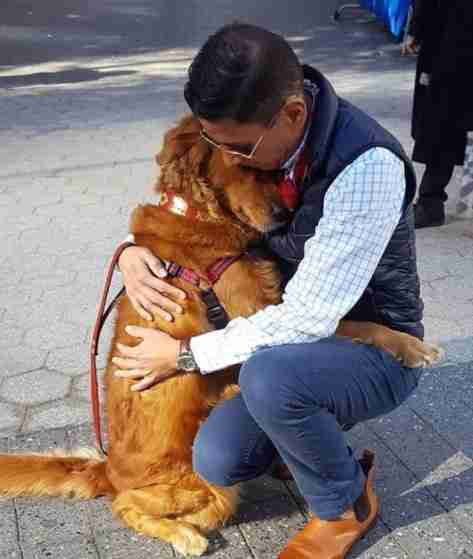 To see more photos of Loubie the golden retriever giving hugs, you can follow her Instagram page. On Christmas Day in 2017, Louboutina and her dad went or a walk, and came back to find their home destroyed by a fire. You can help them get a home again by making a donation.